But folks, I’m also looking forward to being able to eat whatever the hell I want again. You’ve no doubt heard about weird pregnancy cravings: pickles, ice cream, hot sauce on everything, all of that and more in a bowl, at midnight, standing in front of the fridge. My mom craved Italian beef sandwiches when she was pregnant with me, which explains a lot. In my third trimester with my son, I may have spent no less than a car payment on cut, fresh mangoes at Whole Foods. That tricky little baby gave me a sweet tooth I haven’t been able to shake since, though it did subside slightly after he was born. Now we only keep ice cream in the house about half of the time (a vast improvement from the three-varieties-at-any-given-moment habit of yore). The aversions, though, are on another level. I’m not sure people talk about these enough, perhaps in part because they often (though don’t always) fade by the second trimester. There are categories of foods I can’t bear to eat, or, in this particular pregnancy, stand to see others eat or even talk about. Anything with garlic gives me lumberjack-sized burps for the next 12 hours. Anything too rich and I’m in the bathroom within an hour. The other night my husband happily polished off some leftover beef stew I had made just the night before and, dear reader, I had to leave the table before I tossed my crackers. The next day I told my best friend about the bizarre incident and got nauseous in the retelling. At the moment I don’t feel safe eating anything but toast and dry cereal. If the aversions don’t get me, the restrictions bestowed upon me by the well-meaning, but perhaps overcautious, medical establishment will. Though I’m not much of a raw sashimi gal anyway (mercury can cause developmental delays); I love oysters but I’ll be fine without them for a few months (raw shellfish is a common culprit for sea-borne illnesses like blood infections), same with your crudos, tartares, and pâtés (food poisoning, E. coli, and listeria, respectively). I look forward to a sweet reunion with all of these foods, but in the meantime, I’ll live. At my age—36, which for those playing along at home is considered a geriatric pregnancy—it’s worth it for me to consider all the risk factors and though I love food, I can deal without these things for a while if it means sleeping well at night (while I can, amirite?!). But maaaan, a perfect, lacy, runny-yolked fried egg? (Salmonella.) A beautiful deli sandwich made to order? (Nitrates, listeria.) The raw milk, aged Parmigiano-Reggiano that lives in my fridge 100 percent of the time that makes my desperation meals (looking at you, pot of beans) look and taste downright luscious? (Technically listeria but also it’s aged AF so I’m calling this one borderline safe.) My style is officially cramped. Being a pregnant food writer is hard. I wasn’t doing this full-time when I was pregnant with my son, so although I sensed the quandary, I didn’t worry so much about it. But now, it’s as if my muse has suddenly turned on me. Between the things I know my body will reject, and the things I shouldn’t eat because they might seriously harm me, the baby, or threaten the entire pregnancy, it’s hard to imagine earning a living talking about the glory of food if I can barely do so without barfing. In a different line of work, I could simply write off these woes as temporary quirks. Inconvenient at worst, fodder for stories I can tell my kids when they grow up at best. But when you more or less publicly daydream about food for a living, it’s like your identity is stripped away. What ambitious dishes or weekend projects do I even care about, much less have the energy or stomach for now? What do I have to look forward to at the end of a long day if it’s not a plate of something stupidly delicious I cooked myself? Where is the poetry in a dish of Goldfish crackers and a glass of chocolate milk, my current weird tummy-soothing combo? I’ll find that poetry if I have to, or it’s gonna be a long few months. The hardest thing for me to stay away from during this otherwise precious, sacred time is the cheese. Not all cheese, mind you. But a lot of the artisan cheeses I find exciting and will readily make the centerpiece of my no-cook standby dinner are on the pregnant lady’s no-fly list. The amount of misinformation around cheese during pregnancy, and sometimes out-and-out fear-mongering, is atrocious. Everyone from the nurse at my doctor’s office to those pregnancy apps that tell you how big your baby is this week (a blueberry! an onion!) tells you to stay away from all soft cheese due to the risk of listeria. Though that guidance isn’t exactly wrong, it’s laughably vague and it’s not doing cheese any favors, especially here in the U.S. where some folks still side-eye a wedge of brie. 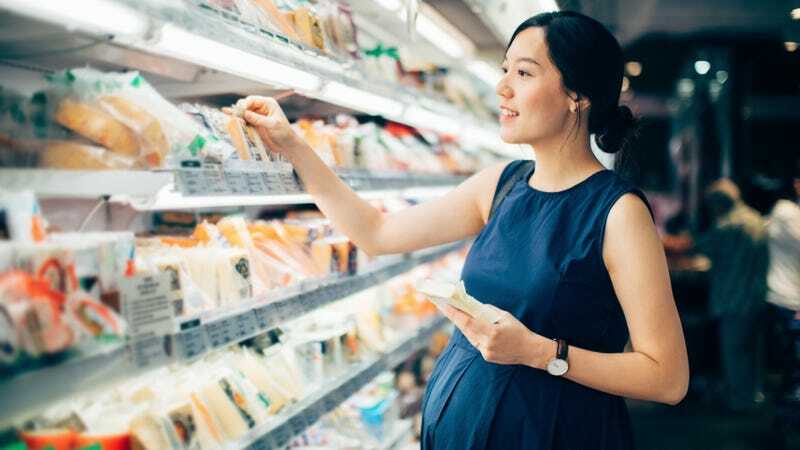 The American Pregnancy Association puts it this way: “You would need to avoid soft cheeses such as brie, Camembert, Roquefort, feta, Gorgonzola, and Mexican style cheeses that include queso blanco and queso fresco, unless they clearly state that they are made from pasteurized milk.” That’s… a lot of cheese to avoid. I mean, maybe your neighbor makes his own fresh cheese in his cellar from the milk of another neighbor’s cow, in which case, I’ll be over as soon as this baby pops out. Or maybe you’re out here hitting up specialty cheese shops regularly, in which case, let’s be best friends. In truth, most soft cheese you find at the supermarket is made with pasteurized milk, and no matter what, the ingredient label will tell you for sure. Even the brie! Even the blue! Bottom line, it’s very hard to accidentally eat cheese made with raw milk. Check the label for that magic word—pasteurized—and you’re fine. Indeed, once this delicate stomach has passed (thoughts and prayers for a breezy, eat-everything second trimester and beyond), I’ll be gleefully schmearing feta on crusty bread and topping all tacos with queso fresco. Hopefully I’ll be ready for any new, wild cravings as things progress. Fingers crossed for an Italian beef craving so I can carry on the proud tradition.